One crazy thing happened this week, I have been traveling through Airbnb for more than 3 years now and they gave me an exclusive deal which I want to share with you people. This is Airbnb Refer and Earn program just like other sites you need to Sign-up through my referral link and book your first trip. But you may have this doubt what is so special about this? Well, let me tell you Airbnb gave me a Loyal Referral Badge which means the people who sign-up from my referral will get 2,200 Rs Airbnb Travel credit instantly. Trust me this exclusive deal available for very few users and I am one of them. Here I will give you the complete details on how you can use 8,222 Rs on Airbnb just by spending 2,800 Rs. As a true traveler, I really want to you people to sign-up for Airbnb. Not only it is giving free 5,422 Rs travel credit but it can give you the memories of a lifetime. So please do read this article till the end to know how this whole process works. First things first without knowing about Airbnb you can’t go any further right? So Airbnb is a travel site which lets you book Hotel Room, Home Stay or an Entire House all over the world including India. If you are planning to travel then you will search for rooms on OYO, Goibibo or MakeMyTrip. Just don’t do it because from those sites you can only book a hotel room but from Airbnb, you can go and stay in other people’s house. Imagine going to any new place and living there like a local that’s what Airbnb is. Now with my referral, you can get free 5,422 Rs Airbnb Travel credit. As mentioned earlier only with my referral you can get 2,200 Rs travel credit right after signing up on Airbnb. I don’t know how long this offer is gonna last so do sign-up to Airbnb ASAP. In order to use 2,200 Rs travel credit, you must take a trip of worth more than 5,000 Rs. Which means you must spend a minimum of 2,800 Rs to book a trip worth more than 5,000 but it doesn’t end here. 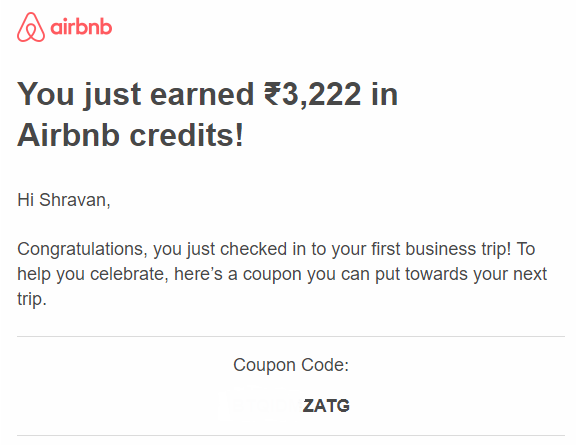 After taking your first trip on Airbnb you will receive a coupon worth 3,222 Rs. To be frank very few people know about this so here is how to claim that. Do you want to make memories by living in a hotel room surrounded by four walls or you want make memories by living in Airbnb home with extra discount to enjoy the entire house things such as garden, their pets, swimming pool & kitchen. It’s your call now!! While booking the room on Airbnb there will be two options one is personal travel and the other one is business travel. So choose business travel on your first booking, sometimes with the business, Airbnb travel credit won’t be applied for that you should verify mobile number & ID proof. Once you completed the trip you will be blessed with 3.222 Rs worth coupon. This Airbnb coupon will be sent to your email and this can be applied without any restriction as there is no minimum amount to use the coupon. Here I am sharing the Airbnb Business Travel coupon which I received on my booking. 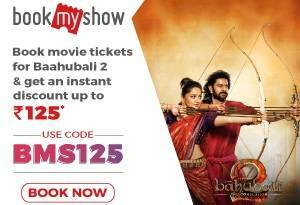 This can be used for any booking with no minimum amount. 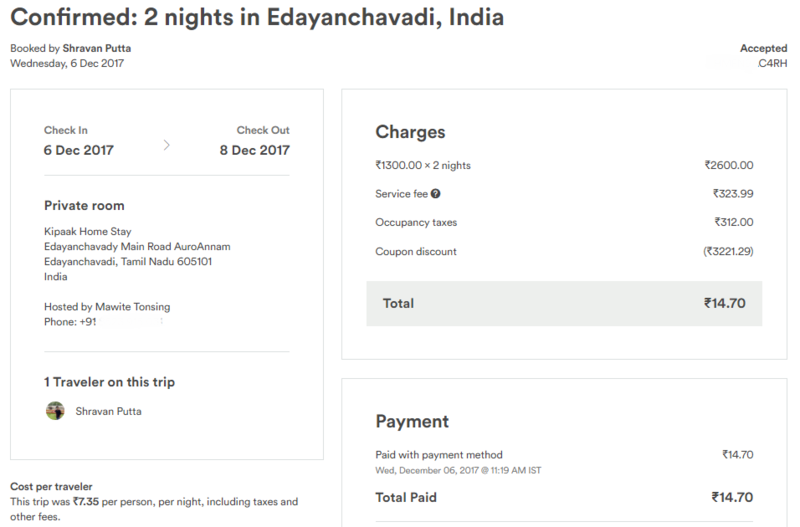 I booked a homestay worth more than 3,000 Rs and I only spent 14Rs on the booking. If you don’t know how to book a room on Airbnb then just read ahead. Let me tell you Airbnb is everything you can book many things from this site. Shared room, Private room, Entire house, Event party house, Lakehouse, Villa and much more options are available on their site. Before booking the room on Airbnb you must verify your ID proof(Any govt ID). Simply follow the below steps to book a room on Airbnb. This process is a little bit different compared to other sites. Just search for a place which you are planning to visit. You will get so many listings choose your preference, you can opt for a private room or an entire house. 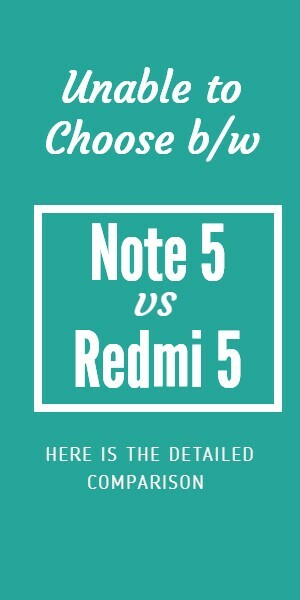 If you have any doubts ask me in the comment section or you can mail me at shravan@flipshope.com. If you want an instant response then you can drop a message on my facebook profile. As soon as you make the Airbnb account you can also join the referral program. Just share your Airbnb referral link with your friends or family but they must complete the first trip worth more than 5000 Rs. For this, you will receive 600 Rs and they will get Flat 1200 Rs off but if you go with my Airbnb referral link then you will get a double discount. Even I get travel credit with your bookings so I would like to help you guys. Because this deal isn’t gonna last forever so use it while it is active. So if you have any doubts or questions you can ask me in the comment section below or you can even mail me at shravan@flipshope.com or send me a message request on Facebook for a quick response. Can I make multiple accounts to get more credits? I am pretty sure everyone got this question but the answer is a big NO. Because Airbnb is a multi-billion dollar site. They have one of the best tracking systems to detect fake accounts moreover you must verify your personal ID on every account. So this makes it easy for them catch and ban all of your accounts. Airbnb Travel Credit can only be applied to the bookings over 5,000 Rs. So make sure that your booking is worth more than that. What can I book on Airbnb? Can I book out of India homes? Can I apply Airbnb Travel Credit on out of country bookings? Yes, you can apply Airbnb travel credit for any type of bookings. If you have any further doubts then you can check the Airbnb Terms and Conditions.